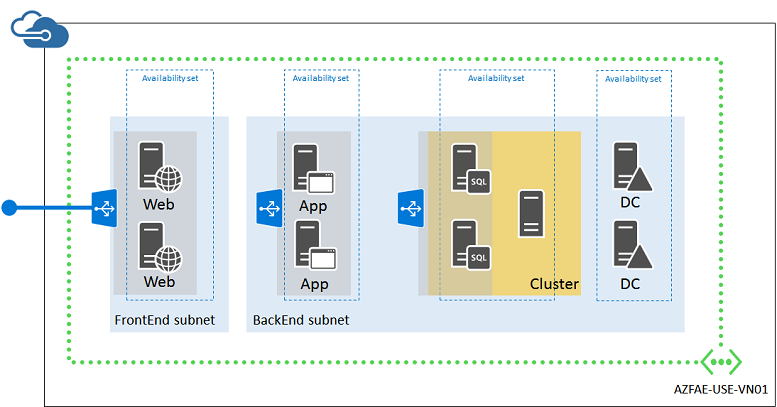 This article walks through building out an example application infrastructure. We detail designing an infrastructure for a simple online store that brings together all the guidelines and decisions around naming conventions, availability sets, virtual networks and load balancers, and actually deploying your virtual machines (VMs). Incoming secure web traffic must be load-balanced among the web servers as customers browse the online store. Order processing traffic in the form of HTTP requests from the web servers must be balanced among the application servers. Additionally, the infrastructure must be designed for high availability. Adventure Works Cycles is using their Enterprise subscription, named Adventure Works Enterprise Subscription, to provide billing for this IT workload. Standard storage for the web servers, application servers, and domain controllers and their data disks. Premium storage for the SQL Server VMs and their data disks. Because the virtual network does not need ongoing connectivity to the Adventure Work Cycles on-premises network, they decided on a cloud-only virtual network. Here is the resulting configuration.